A series of five Quests designed for levels 1-5. Mighty Lung Wa once controlled much of Tian Xia, but the empire crumbled a century ago. Three Successor States have squabbled for dominance ever since, each insisting that it alone is the rightful inheritor of Lung Wa's glory. In the shadow of these mighty nations, the humble land of Shokuro has sought the means to discourage its neighbors' territorial ambitions and earn their respect. When a retired hero learns of a lost, legendary palace that might protect relics of the old empire, she calls on the Pathfinder Society for assistance finding the fabled site. The PCs must travel to each of the Successor States in search of clues to uncover the palace and the treasures within. Written by Katherine Cross, Sarah Hood, Jason Owen Black, and Christopher Rowe. "I have pliers" - fun, diverse, and memorable! I will probably expand this review in the near future, but after playing and running this quest series multiple times, I find that it never gets old! 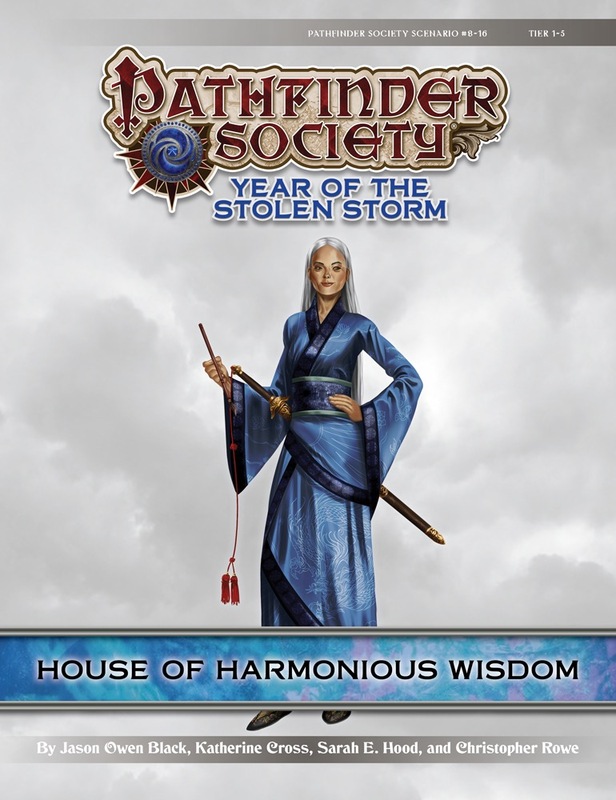 From the initial briefing to the final encounter, House of Harmonious Wisdom is a fun (without ever getting too silly) and engaging romp through parts of Tien Xia that don't get seen too often in Organized Play. Each quest has elements that allow characters of different strengths (martial, social, mental, etc.) to shine, and very few completely "prevent" characters from feeling like they can participate fully. It also allows the characters to learn the plot and backstory of the adventure, which is one of my criteria for giving a five-star review. "Who would make the harvest festival stew if Wu got his head bitten off? No one, that’s who." Personal advice to GMs re: Inkstains - After having played this twice and GM'd it at least twice (plus observed another GM run this particular quest once), I think that Inkstains almost works better if the map is not used except for flavor/descriptions. Especially if you are trying to fit #8-16 into a ~4 hour time slot at a convention or game night, running the "encounter" for Inkstains on the map seems to slow things down versus "theater of the mind" style. The House of Harmonious Wisdom is not your average scenario. As mentioned in the blurb, it’s 5 quests that each take roughly an hour. In that aspect it’s similar to the Silverhex Chronicles, Phantom Phenomena or Honor’s Echo. However I felt like the storyline was better developed and was more a complete package, though arguably it is still something that could be improved upon even further. I typically like quests. They’re short and never dull. In this case I was pleasantly surprised by the diversity presented in these quests. Each one was noticeably different from the rest. There was a puzzle, some role-play, a chase and a particularly interesting fight with unique mechanics. Although the end felt a bit too forced, and made me wonder why one NPC in particular was even there, I had a great time. I honestly think this scenario is best played over multiple days instead of in one setting. That’s not to say that playing the quests back to back is a bad thing. I just feel like it will be more memorable that way and that it would make the conclusion feel less out of the blue. For an experiment, I’d say this worked rather well, but I’m not entirely sold if it’s something that should get repeated. Right now the transition from the middle three quests to the final one is still a bit too blunt and harsh, but still better than in other similar questlines. Compared to the more traditional quest-format, I'd say this is a vast improvement, both in terms of variety and storyline. As such I highly recommend it. Quests that make sense, tie in with each other, and offer something for everyone. Some socializing, some combat, some light puzzle solving. All around solid. One of the most unusual yet enjoyable experiences in many scenarios. I had a blast, and I laughed so hard that I think I cracked a rib at the antics the scenario's unique mechanics allowed us to get up to. I will never forget the Jade Ogre style and our irascible tengu Old Petey's unforgettable pile-driver from a second story window. Today, we are all Old Petey. This series is amazing. It has great stakes, great npcs and seriously fun mechanics. 10/10 will play again. Wait, Katherine Cross wrote part of this? Like Quinnae_Moon Katherine Cross? You have my attention. I am now interested. Yup. I just came here from her twitter feed. That's why I print my scenarios myself. Marco wanna be a bit more specific? Something like more printed Tian Xia products? Yes, especially a series of quests in the different successor states, playable in different order sounds great! This may well be the first Quest I GM. So exactly this product but as a printed book? Actually a full modules worth of quests *could* be pretty great, but sounds like it could be a nightmare to make. Considering it'd be an ultra-compact AP? Yeahhhh... don't see that happening any time soon? Oh! Oh! More quests! I am so excited! This will be GREAT for convention play! I ❤ quests!! I am so excited to see a quest series for levels 1-5, even better one that is set in Tian Xia! It's Christmas! Again! Interesting. Wonder if that's just "Lingshen and Shenmen" or if Amanadar and Kaoling (maybe Jinn) are included in that statement. Neighbors by borders, neighbors by proximity, and neighbors by shared history—it's a little of each. Even though i´m interested in the stories told in a few Pathfinder Society Scenarios, i can´t find any description about page count, art, creatures etc. Also i buy all Pathfinder products as a print product and have a very low interest in pdfs (i know i may be in the minority there). If they would be collected into print form, i would probably buy them all. Maybe you could do a blog with a sample content preview? That would probably get a lot of people into buying some of these adventures that are only buying the modules line right now (like me). A book full of quests reminds me of those d20 supplements AEG used to print. I'm really excited for this module. I love quests. I love Tian Xia. I especially love how the dynamics between the countries we've seen hinted at in other books really compares well with what I imagine a romanticized fantasy Asia would have developed if China and Japan were basically on the same island. Yep since they are Tier 1-5 they will not be evergreen. I have all but one of those. My collection of flip-mats has grown ever since I started GMing at conventions where I could not draw everything. How is this going to work if they are not evergreen? Are pregens going to be required for this? Is it a commitment to play all five pieces on the same character and thus restrict the ability to draw in new players to the campaign? Is it likewise possible, since Quests have separate parts, to play each part on a different character (since it is apparently *not* 'evergreen') for the same level of credit of playing 'one piece'? Not complaining, just trying to get an understanding of how this will work. When this is actually available, could somebody write a short description of which successor states are in it and what is the vague quest in each? Perhaps by designating them as "quests" that would allow for being treated as evergreen, since, unless I'm mistaken, all other "quests" are? experiment means its a trial to see if a quest line is worthwhile within the normal seasons scenario mix. I for one am happy to get a look at the new format and hope it will be viable as it will give another style to pfs adventures. It's a lovely mix from the heart of fallen Lung Wa. Two quests take place in Lingshen (one urban and one wilderness). One quest takes place in Po Li. One quest takes place in Quain. One quest takes place in Shokuro. We posted a blog lauding this set of quests on Monday, and I encourage you to check it out. Because Pathfinder Society blog readership draws heavily on the player base (not just GMs), I typically avoid any spoilers more dramatic than what appears on the product page, so you'll rarely see my scenario preview blogs describing in detail what the story's about. How many pages does this have? Are all PFS pdfs the same page count? How many illustrations are inside a PFS pdf? As there are no modules this year (so far), i would like to know if these are roughly the same format. There is not hard-coded number of pages in each scenario. Over the past ~6 years, Pathfinder Society scenarios have each had around 20–26 pages of adventure content, not including the stat block appendices included at the back of adventures for the past two years. There are a few adventures that are longer for whatever reason, but those are more an exception. As scenarios generally fall into this range, I do not see the need to post page counts for each adventure. In this case, the quest format and the considerable number of Flip-Mat images reproduced in this adventure make this a little longer, with closer to 30 pages of adventure content. Scenarios have a set art budget that accounts for about 2–3 new illustrations, plus a map or two. This occasionally varies based on the scenario's needs and the number of custom maps we need to order. Scenarios also borrow from existing Pathfinder art, especially creature art, so that a GM has a fun reference to use in describing a monster or showing the image to players. Scenarios are all approximately the same format, with rare exceptions (like this set of quests). I encourage you to download a few of the free adventures we offer, including both several of the quest sets (like Phantom Phenomena or Honor's Echo) and the First Steps scenarios. These can give you a solid sense of what each format entails. Scenarios have many similarities to Pathfinder Modules; the former just tend to be shorter (intended to take about 4–5 hours) and include some rules references that tie them into the Pathfinder Society Roleplaying Guild. You have expressed reticence about purchasing PDF products. I encourage you to take a look at what the Pathfinder Society Scenario and Pathfinder Society Quests formats have to offer. Maybe you'll change your mind—especially with more than 230 adventures to choose from. Thank you John, giving us that information is always appreciated. This states directly that the quests are replayable. This in NO way indicates that a character's level makes something un-replayable. RAW means that this scenario can be replayed N times for N characters. It also means, RAW, that someone can replay it with N number of 5th level characters. By RAW, you are also required to note clarifications or updates posted by developers. So - no replay except at first level. I acknowledge what appears in the adventure and direct you to see my recent post in the preview blog. It is replayable at 1st level. As colleagues' time permits, we can endeavor to update the original text. Until then, go by this update. It's probably too late to get an real answer, but I'm assuming this means you can only apply the chronicle sheet to a level 1? Specifically, can I play a level 4 pregen and downgrade the sheet to a real level 1 character for 500gp? But the ever-green-i-ness isn't too clear here. I think this is the first time you'd have a non-level 1 pregen playing with a level 1 evergreen requirement? Can someone explain how this differs from the standard Quests? Wondering why this qualifies as a scenario, but the quests are their own thing. It was released mid-season and is also 1-5 instead of Tier 1. Are there not other quests released partway into a season? Or do those not count because they're not the same as current quests (only boons and 1-2 encounters)? This series presented even more opportunities because this is the first time we've released a full series of quests mid-season, it's the first time we've presented a full series of quests at multiple subtiers, and it's also the first series of quests we've centered in Tian Xia. Cool, but I was thinking more along the lines of running and reporting. The blog doesn't really specify other than to say they're more quests. Do you have to do all five in one sitting? Can you do one at a time? I don't have this adventure, but we're looking to do quests in our lodge after our upcoming convention, and I wasn't sure if this should be added to the list of "to get". Having played and ran a few of these quests, the answer is yes, it works just like other quests. At the end of the day, this is a series of quests that is a little bit different than normal quests. Most quests are released at the beginning of the season, and are for level 1 only. The House of Harmonious Wisdom is different for a few reasons. 1) This quest is a 1-5 series! There are two subtiers, 1-2 and 4-5. 2) It was released in the middle of the season! Normally, quests are released at the Beginning of the season, and are playable with Pregens Only. This set is different because you can play with any 1-5 character! 3) This quest is evergreen! That means that you can play it as many times as you like at level 1 (like the Confirmation, Honors Echo, Wounded Wisp, etc.) It also means that you can only play it once above level 1, just like any other evergreen adventure. If you are familiar with the chronicle sheets for the quests so far (Silverhex Chronicles, Phantom Phenomena, Honor's Echo) then this chronicle shouldn't have many surprises for you. Hopefully this was helpful! Thanks everyone. That's definitely the info I was looking for. Hopefully our Quest Days will end up being at least remotely popular for the lodge. Do you just get the normal 1 xp for completing this mod? Yes, with scaling PP and gold rewards based on the number of quests completed. Got a question regarding the chronicle sheet. It has Impressive Boon listed twice. Is this a mistake or do you get two boons?